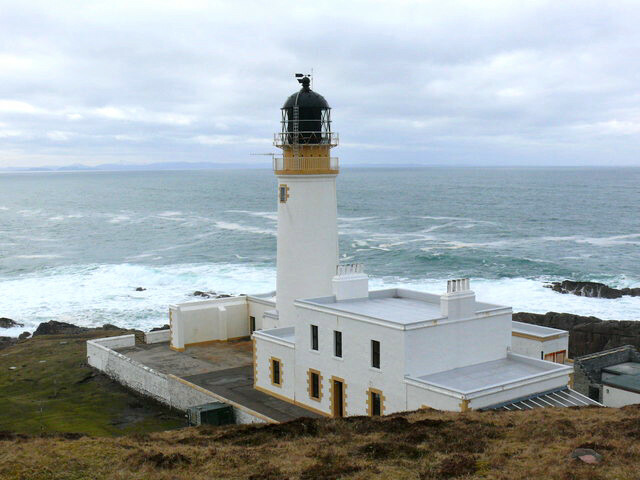 Situated on a remote peninsula in the North-West Scottish Highlands, 13 miles from the village of Gairloch and 3 miles from the nearest dwelling, is Rua Reidh Lighthouse. It was built by a cousin of the author Robert Louis Stevenson in 1910, and is now totally automated. It's keepers residence has been converted into holiday accommodation. It is available as holiday accommodation either on a Bed and Breakfast per night basis, or alternatively you can rent the whole house for your large group. They also offer guided activity holidays, such as walks, wildlife trips and rock climbing. There is also a small visitor centre on the wildlife in the surrounding area, history of the lighthouse, vending machine catering and toilets open all year round from 9am-6pm. From the village of Gairloch go through the village for a mile before turning left by the Police Station onto a road signposted to Melvaig. Continue along this road for 13 miles, the last 3 of these being the private road to the lighthouse which is a narrow winding road.